I am a mother of 4-year-old twin boys, and boy are they ALL BOY. They don’t go for finger puppets, frilly hearts, or anything girly. I made this project with them in mind. The frog’s mouth opens up so you can put treasures inside. Prevents many treasures from ending up in pants pockets and ruining a batch of laundry — trust me, I speak from some experience here! I also home school my boys, and often look for fun things to use as math manipulatives. So inside this frog are some flies: you can make as many as you want and then count them, add and subtract them, and so on. And finally, with summer holidays coming up, this is a nice little toy to pack in a suitcase. 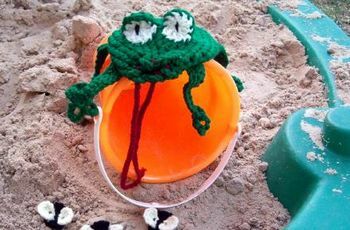 If you really have adventurous little ones, they could put real bugs inside the frog since it does provide some air holes, yet most insects can not get out. I don’t encourage the capturing of creeping, crawly things but it could be done. – Small amounts of red (A), white (B), and black (C) worsted weight yarn. Due to the small size of the flies, this toy is not recommend for children who may still put things in their mouth. Please use common sense and your best judgment when making this, or any, toy for young children. Adult supervision is recommended. With color A, ch 50. Fasten off. Weave in ends. Thread chain though loops on the frog so that when they are pulled closed, the long “tongue” part is in the middle. Make two with color B and two with MC. Ch 3, work 11 dc in 3rd ch from hook, sl st to second chain of ch-3 to form ring. Fasten off, leaving a long tail to attach the eye parts. 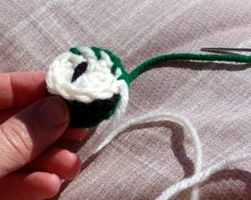 On the white part of the eye, with a needle and color C, embroider a “pupil” in the center of the eye. 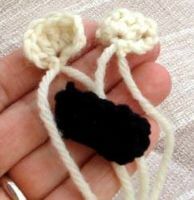 Mine were made with two vertical stitches using a single strand of yarn. You can be creative and make a tiny x or a horizontal line to get a different look. You could even use yellow instead of white. Be creative, it’s your frog! 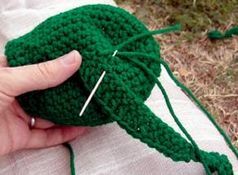 Sew the eyes to the frog. Next row: Ch 2, turn, skip first two sts, dc in each of the next 10 sts, hdc in each of the next 4 sts, sc in each of the next 3 sts, sl st in next stitch. Fasten off. Next row: Ch 2, skip first two sts, dc in each of the next 8 sts, hdc in each of the next 3 sts, sl st in next st. Fasten off. With color C, ch 7. Row 1: Dc in 3rd ch from hook and in each remaining ch. (6 dc). With color B, leaving a 3-inch tail, ch 4. Row 1:Work [4 dc, ch 3, sl st] all in the fourth ch from hook. Fasten off, leaving a 3-inch tail. Thread tails of the wings through the dc sts on the body and tie securely. Trim ends, leaving a little bit to look like legs (see photos). Tawnya is a stay at home mother and wife to a Drill Sergeant for the United States Army. She is currently living in Oklahoma. 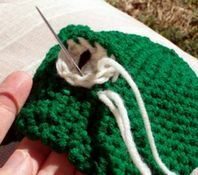 In what little spare time she has she crochets, knits, sews, and machine embroiders. She learned to crochet from her grandma.